Goodbye 8570.01, Hello DoDD 8140.01! The growth of the cybersecurity job market continues to outpace the numbers of qualified and available IT professionals with cybersecurity degrees, according to Fortune magazine. To meet the needs of an industry that is still woefully understaffed, new cybersecurity degree programs have blossomed at many universities across the nation. Several universities and programs are already distinguishable from their competition. Here is a look at the top seven, who they are and what makes them special. UTSA’s cybersecurity program is one of the top three in the nation, reports the Ponemon Institute. The UTSA Department of Information Systems and Cybersecurity is within the College of Business, and its cybersecurity degrees include a Bachelor of Business Administration in Cybersecurity and a Master of Science in Information Technology with a Cybersecurity concentration. The department holds the distinction of accreditation from the National Security Agency as a Center of Research Excellency. In addition to being a traditional educational setting, the UTSA Department of Information Systems and Cybersecurity is also a training ground for IT and cybersecurity professionals already engaged in careers. Students, in turn, experience the benefit of studying alongside seasoned industry veterans. The BBA in cybersecurity is an in-person, 120-credit program that costs about $23,000 annually for in-state students. IT professionals rank Norwich University’s cybersecurity programs highly. Norwich offers a Bachelor of Science in Cybersecurity and a Master of Science in Information Security and Assurance. The NSA recognizes Norwich as a Center for Academic Excellence in Information Assurance Education. 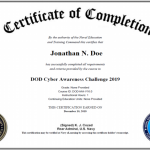 Both the undergraduate and graduate cybersecurity degrees are available via online programs. The Norwich programs are a blend of business management and the latest information technology and cybersecurity, such as malware forensics, cyber investigation techniques, information warfare and cyberspace politics. There are two concentrations at the undergraduate level: computer forensics and vulnerability management. The program is available year round over three trimesters. Costs are roughly $375 per credit. Syracuse University offers a Master of Science or a certificate of advanced study in cybersecurity. The latter requires a bachelor’s degree as a prerequisite. Both programs are on-campus only. The master’s program is 30 credits and covers principals of operating systems, assurance foundations, Internet security and algorithm analysis. The certificate program covers much of the same. The program requires at least a year to complete and costs about $18,000 to $30,000, depending on whether you live on campus. Costs for the M.S. program, including housing, meals and fees, are roughly $45,000 annually. Carnegie Mellon University offers its Master of Science in Information Security through its Information Networking Institute, which is part of its College of Engineering. The College of Engineering is NSA-designated as a National Center of Academic Excellence in Information Assurance Education. The MSIS program is on-campus only and spans 16 to 20 months. Some of the program’s learning objectives include information security leadership skills, information security theory, interdisciplinary aspects of information security, information security challenges and information security risk-assessment. The MSIS is a National Science Foundation-funded CyberCorps Scholarship for Service Program, so U.S. citizens admitted to INI are eligible for full scholarships. Tuition for INI programs is $21,000 per semester, as of 2016. Other expenses, such as room, board, books, supplies and travel potentially add an additional $20,000 per year. Purdue University’s graduate studies in information security, or infosec, encompass several degree paths, such as interdisciplinary Master of Science in Information Technology with a concentration in cyber forensics, a standard M.S. with a focus on infosec topics or a PhD in Technology with a specialization in cyber forensics, which also entails a dissertation topic in infosec. Purdue also has an undergraduate program, the Bachelor of Science in Computer Science. The B.S. in computer science contains curriculum that touches upon security, but Purdue University does not at this time specifically offer a B.S. in cyber forensics. Undergraduates have the option of a five-year combined B.S./M.S. program. All programs are on-campus only. Total costs are roughly $20,000 for in-state students. The University of Southern California’s graduate program in cybersecurity engineering is available on-campus or online, the latter through the Distance Education Network. The 32-unit program prepares you for a range of IT jobs requiring cybersecurity knowledge or for a long term education path toward a PhD. Foundations of Information Security, Secure Systems Engineering, Distributed Systems and Network Security are some of the required courses. You can take two elective courses as well that total no more than seven units, such as Applied Cryptography or Network Forensics. Tuition ranges from about $5,000 to $7,000 per three- and four-unit course, respectively. The Master of Cybersecurity and Leadership program at the University of Washington, Tacoma, debuted in 2013 and produced its first 27 graduates the following year. It is a 40-credit, non-thesis program that costs roughly $20,000 per year. The learning objectives of the program encompass interdisciplinary knowledge and include risk management, interpersonal skills, communication and leadership. Business Essentials, Leadership, Team Dynamics, Internet Security and Cybersecurity Management are some of the offered courses. 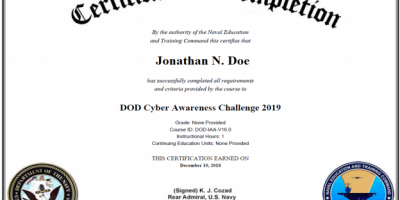 An integral hands-on aspect of the program are the capstone challenges, such as assessing network security inside a cyber-threat lab or developing security consulting skills. Microsoft is one company that hosts capstone challenges, in which students report to a company-hosted brick-and-mortar site over several weeks and live-test the application of security principals or cybersecurity infrastructure. This program is on-campus only. Again, why are IT Certification schools not recommended? Yes, certifications are definitely a way to help achieve IAT level certifications. CISSP, Security+, and more! What is DoD Directive (DoDD) 8570? Join our mailing list to receive the DoD IA news and updates on changes in STIGS and policy.